Did you know that SWEET POTATO (kamote) far exceeds the nutrition and health values of rice? Here are the benefits of substituting rice with kamote: 1. 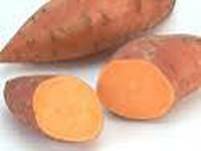 Sweet potato is more filling and suppresses hunger pangs longer. It is also cheaper than rice. 2. Unlike rice, it is easy to grow. It grows in backyards with or without fertilizers. 4. Rice cannot match the nutritional values of potato. Because rice converts to sugar in the body, the Philippines register as a top producer of diabetics in the world. The poor tends to load up on rice and less on the dish which are more expensive. That makes them vulnerable to diabetes, an ailment known in developed countries as a rich man’s disease. 5. The nutritional values of a 3 oz. baked sweet potato are: calories 90, fat 0 g, saturated fat 0 g, cholesterol 0 mg, carbohydrate 21 g, protein 2 g, dietary fiber 3 g, sodium 36 mg, vitamin A 19,218 IU, folic acid 6 micrograms, pantothenic acid 1 mg, vitamin B6 <1 mg, vitamin C 20 mg, vitamin E 1 mg, calcium 38 mg, manganese 1 mg, carotenoids 11,552 mcg, potassium 475 mg and magnesium 45 mg. Compare that to a 100 g serving of white rice with: calories 361 kcal, water 10.2 g, total fat 0.8 g, dietary fiber 0.6 g, calcium 8 mg, phosphorous 87 mg, potassium 111 mg, sodium 31 mg, vitamin B1 0.07 mg, vitamin B2 0.02 mg, niacin 1.8 g, protein 6 g and carbohydrates 82 g.
bad cholesterol and even blood sugar when eaten as SUBSTITUTE TO RICE! The purple sweet potato (kamote) is particularly effective for lowering hypertension.